The "Green New Deal" will produce the opposite of its intended goal of reducing carbon emissions by stifling energy innovation, according to an expert at the American Enterprise Institute. Democratic socialist Alexandria Ocasio-Cortez released her proposal Thursday. The 10-year plan calls for the "economic transformation" of the United States, the elimination of air travel, replacement or upgrade of every building, and a guaranteed federal job with paid vacation for every person in America even if they are "unwilling to work." Ocasio-Cortez is light on the details of how to finance the deal, estimated at anywhere between $2 trillion and $5.7 trillion, "or more." "At the end of the day, this is an investment in our economy that should grow our wealth as a nation," Ocasio-Cortez said. "So the question isn't how will we pay for it, but what will we do with our new shared prosperity." 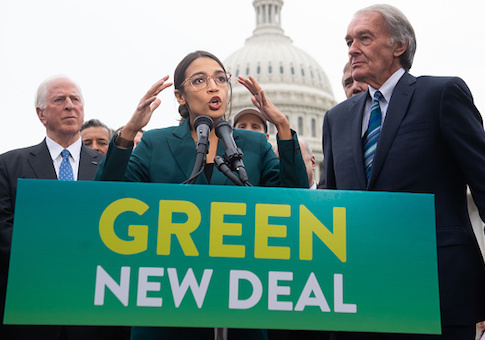 AEI resident fellow Alex Brill explained last week that regardless of cost, the unintended consequences of the Green New Deal are "the worst imaginable." Brill writes that the Green New Deal's financing through bureaucratic funding schemes could "inhibit clean technology and energy efficiency innovation," because grants will "inevitably be earmarked for investments that can be defined using only tools and technologies already at hand." Energy innovation in the private sector would also be inhibited as private companies would seek federal financing instead of private investment for green energy projects. Brill cites transportation spending data that show highway spending in President Barack Obama's nearly $1 trillion stimulus bill in 2009 actually "reduced state spending on highway projects by 81 cents." Brill also notes the funding process would be political by nature, as inevitably Green New Deal projects would go to those that are preferred by powerful liberal lawmakers in Congress. "Some lawmakers will insist on a certain level of investment in solar projects, while others will demand more money for wind turbines or geothermal power," Brill writes. "The final allocation will depend on the relative clout of the lawmakers and will inefficiently differ from the allocations that consumers and producers would demand." "In short, the Green New Deal would be a deficit financed expansion of federal bureaucratic power to dictate investment decisions in one of the most dynamic sectors of the economy," Brill concludes. Sen. John Barrasso (R., Wyo.) called the Green New Deal a "raw deal for the taxpayer" that would increase electric bills by up to $3,800 per year. "It's a socialist manifesto that lays out a laundry list of government giveaways, including guaranteed food, housing, college, and economic security even for those who refuse to work," Barrasso said. "As Democrats take a hard left turn, this radical proposal would take our growing economy off the cliff and our nation into bankruptcy. It's the first step down a dark path to socialism." Barrasso said the solution to lower emissions is through private innovation. "I want to make American energy as clean as we can, as fast as we can, without raising costs for consumers," he said. "We can reduce carbon dioxide emissions by supporting new innovative technologies like advanced nuclear power, carbon capture, and carbon utilization. Innovation, not regulation, will lead to lower emissions and a stronger economy."